Ever heard of a “zettabyte?” It’s the same as 1,000 exabytes or, in more familiar terms, 1,099,511,627,776 gigabytes. By 2018, global IP traffic (fixed and mobile) will hit 1.6 zettabytes, Cisco claims in a new report—nearly three times the total traffic carried in 2013. Put another way, 2018’s global IP traffic—more than 1.5 trillion gigabytes’ worth—will be more than all the IP traffic that was carried globally between 1984 to 2013. That was a comparatively unimpressive 1.3 zettabytes. More relevant to those of us who are watching more of our video online is this factoid from Cisco: We’re going to be contributing to that boost in traffic. Cisco says IP video will account for 79 percent of all IP traffic by 2018. That’s up from 66 percent in 2013. Ultra HD video—also known as 4K, which is four times the resolution of 1080p HD—will comprise 11 percent of IP video traffic by 2018, up from 0.1 percent in 2013. HD video will cover 52 percent of IP video traffic by then; up from 36 percent last year. SD (standard definition) video will account for the rest. So will that mean more feuds between content providers and distributors like the public finger-pointing we’ve seen recently from Netflix and Verizon? After all, the increased amount of streaming video is putting a strain on network traffic—or so Internet service providers would argue. And that’s before the kind of increases that Cisco is forecasting in its report. At least, broadband speeds are expected to improve. Cisco says that world-average broadband speeds will reach 42 Mbps by 2018, up from 16 Mbps at the end of last year. 55 percent of broadband connections will be faster than 10 Mbps by 2018. Japanese and South Korean average broadband speeds will approach 100 Mbps by that time. Cisco expects Internet traffic to triple by 2018. By 2018, the majority of IP traffic will come from non-PC devices—smartphones and tablets in the parlance of us humans. That would seemingly confirm that the desktop browser’s days of dominance are coming to an end. In 2013, non-PC devices accounted for 33 percent of global IP traffic, says Cisco. By 2018, non-PCs will create 57 percent of it. 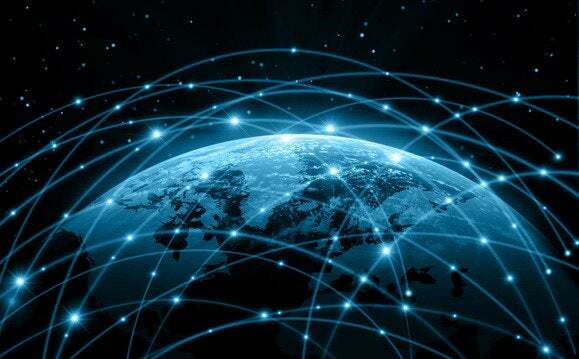 By 2018, there will be nearly 21 billion global network connections, including fixed/mobile personal devices and machine-to-machine (M2M) connections That’s up from about 12.4 billion connections in 2013. There will be 7.3 billion M2M connections globally in 2018, Cisco predicts, which is nearly one for every person on Earth. If Cisco is correct, our fast-paced digital life is about to be much faster, and much busier. So get used to zettabytes, and become familiar with “yottabytes,” which are 1,000 zettabytes in size. Given the way IP traffic is growing, we’ll hit the yottabytes stage in our lifetimes. Those of us who remember when having a 20 megabyte hard drive was the epitome of cool? We’d be wise to shut up about it from now on.